For the tenth edition of 'Mania, the WWF returned to the hallowed Madison Square Garden. This installment featured not one, but two WWF Title matches, as co-Rumble winners Bret Hart and Lex Luger each got a crack at Yokozuna's championship. However it was the opening bout and a match where Shawn Michaels danced with a ladder that stole the show. Since Luger won the coin toss to face Yokozuna first (not sure why that's winning exactly, but ok), Bret had to wrestle a secondary match prior to getting his own title shot. Luckily for everyone, he had just begun a feud with his brother Owen, and the Hart brothers tore the house down in the opening contest. Famously the brothers had worked out an action-packed, high-flying match but Bret realized the night before the event that a bunch of aerial moves would get Owen cheered instead of booed. So they scrapped everything and started over. No complaints from me - this match was twenty minutes of some of the finest wrestling I've ever seen, capped off by a career-making win for Owen. One of the weirder matches I've witnessed took place third on the card, as Randy Savage fought Crush in a variation of a Falls Count Anywhere match. Now I'm not sure if someone in charge was drunk when they came up with this, or if they were just confused by the FCA rules, but in this case the object was to pin your opponent outside the ring, roll back into the ring, and hope the opponent couldn't get back in within 60 seconds. There were three falls in this match before Crush finally failed to get back within the time limit, which meant that in a 9-minute match, nearly 3 full minutes consisted of one of the wrestlers waiting inside the ring for the other to climb back in. Did TNA come up with these rules? 'Mania 10 had a pair of decent little title matches - Alundra Blayze vs. Lelani Kai (who also competed at 'Mania 1), and the Quebecers vs. Men on a Mission (better than it had any right to be) - before the first WWF Title match. Lex Luger then challenged Yokozuna in a rematch from the previous Summerslam. Unfortunately they were given way too much time and did basically zero with it. Probably a good 4-5 minutes of this 14-minute yawner consisted of Yoko applying a trapezius nerve hold while Luger just sat there taking it. Uhh Lex, maybe reach up and punch him so he'll let go of you? Lex was booked to lose the match by disqualification when special referee Mr. Perfect basically turned heel on him, which famously led to....nothing. No feud between the two followed this angle. I guess it was revenge for Luger beating Perfect the previous year? A pointless 60-second Earthquake vs. Adam Bomb squash was inexplicably sandwiched between Luger-Yoko and Michaels vs. Razor. Not sure why, but the less said the better. 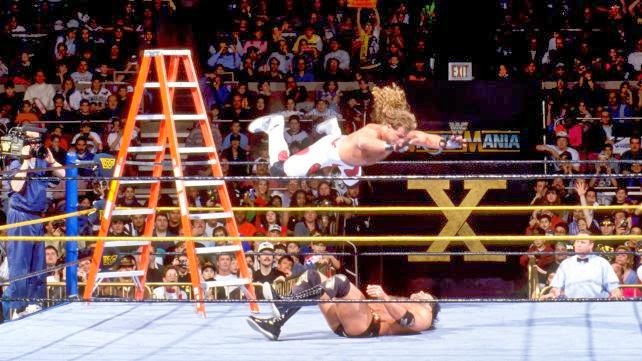 The Ladder Match - Shawn Michaels vs. Razor Ramon for the undisputed Intercontinental Title. If any match was going to overshadow both the main event of WrestleMania and the Bret-Owen clinic, this was it. The years have actually favored Bret vs. Owen in my opinion, but at the time this match was the goddamnedest thing I had ever seen. As it stands now they're still 1 and 1A for 1994 Match of the Year. HBK and Razor (and apparently Bret Hart as well) created the prototype for the Ladder Match, and basically every such match since owes it a debt. In terms of defining the Spotfest, this might be the most important single match of the 1990s. Possibly the single most influential match of the 90s. The main event saw Bret avenge his 'Mania 9 loss to Yokozuna in another decent 10-minute affair (which was also the first time two consecutive WrestleManias featured the same main event). I think overall I like the 'Mania 9 match better as there was more back and forth. Yoko dominated the rematch and only lost because he fell off the ropes while setting up the Bonzai Drop. Pretty stupid ending really (like their first encounter). 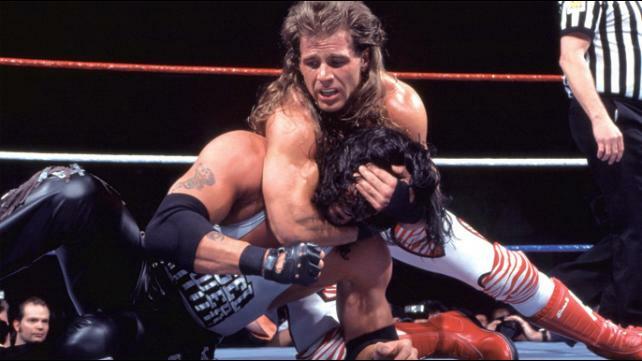 WrestleMania X is remembered primarily for two matches, Bret vs. Owen and HBK vs. Razor. It was also the first WrestleMania without Hulk Hogan, and officially kicked off the New Generation era, with Bret Hart truly carrying the WWF ball. It was an uneven card but the fact that it spawned two five-star classic matches earns it a very high spot on the all-time list. What I'd Change: Savage vs. Crush should've been a normal Falls Count Anywhere match, and about five minutes should've been added (those five minutes could've been cut from Luger vs. Yokozuna). Also part of me still wishes Luger had won the belt so he could've defended it against Bret in the main event. Most Disappointing Match: The aforementioned Lex Luger vs. Yokozuna - a total snorefest that wasn't even close to their first encounter (which wasn't amazing by any means, but it was at least watchable). Most Pleasant Surprise: I honestly didn't have high hopes for a match involving two guys climbing a ladder. Man was I wrong. Here's one of those WrestleMania shows that felt nothing like a supercard should. The HCC was probably the worst venue ever chosen for 'Mania, and while there was nothing out-and-out offensive on the card, it also didn't seem special in any way. 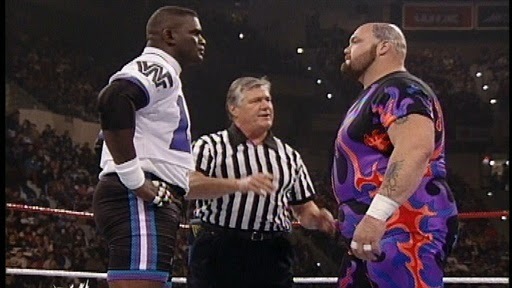 The WWF tried to create a media blitz by featuring Bam Bam Bigelow against NY Giants superstar Lawrence Taylor, much like they featured Mr. T a decade earlier. The only problem was #1 LT wasn't a household name like Mr. T, and Bam Bam was a midcard heel with little main event credibility. The fact that this match went on last is astounding. It was an ok bout, and LT did the best with what little wrestling acumen he possessed. But this is a perfect example of why non-wrestling celebrities should not be given an in-ring role, especially if they're supposed to be the babyface. It leads to a no-win situation, as the non-wrestler basically has to win the match to keep the audience happy, but it makes the actual wrestler look incredibly weak when he loses to an untrained guest star. If anyone with even a modicum of athletic ability can train for a month and beat an established veteran wrestler, what's so difficult about being a trained veteran wrestler? So. You're goin' with that as the main event? Alright then. The real main event of the show was also the only real bright spot on the card, as former friends Diesel and Shawn Michaels battled for the WWF Title. Diesel's sudden main event push was the WWF's attempt to recreate the success of Hulk Hogan. Sadly Kevin Nash had nowhere near the overwhelming fan support Hogan did, and the Hartford crowd actually ended up cheering the breathtaking athletic abilities of Shawn Michaels. Even in losing the match, Shawn positioned himself as the next main event babyface. The rest of the show was mired in mediocrity, with the pairing of Owen Hart and the returning Yokozuna winning the Tag Titles being the only noteworthy moment. The match itself wasn't great but I loved this new heel team. Bret Hart and Bob Backlund had their blowoff I Quit match, and somehow managed to stink up the place. It didn't help that they were only given around nine minutes, but where I Quit matches are supposed to be hate-filled and brutal, this was goofy and forgettable, and Backlund's final "I Quit" moment consisted of him yelling incoherently. Other than that we got a throwaway opener between The Blu Brothers and new superteam The Allied Powers (Lex Luger and Davey Boy Smith - a pretty cool idea for a tandem that unfortunately went nowhere), a weak Intercontinental Title match between Jeff Jarrett and Razor Ramon, and a nigh unwatchable Undertaker-King Kong Bundy showdown. I had been a Bundy fan in the 80s and was glad to see him return, but quickly realized his in-ring ability didn't at all cut it in this new era. 'Mania 11 illustrated what a low point 1995 was for the WWF. Several midcarders showed they were ready to become upper tier players, but the Diesel experiment clearly wasn't working, and Bret Hart was seemingly being fed scraps for most of the year while the Kliq took center stage. What I'd Change: First off, this show needed a better venue. Nothing screams "B-show" like the Hartford Civic Center. Next I'd put Diesel vs. Shawn in the main event slot. LT vs. Bam Bam wasn't nearly important enough to go on last. Most Disappointing Match: Bret Hart vs. Bob Backlund. How'd they screw that one up? Most Pleasant Surprise: Yokozuna being Owen's mystery tag team partner. 'Mania 12 was a quantum leap over its predecessor in terms of big-show presentation and wrestling quality. The card featured only six matches (plus one on the pre-show), but the WWF showcased their talented if somewhat shrunken roster plus a few nostalgic stars, with no guest celebrities whatsoever, and the result was a very solid show with few bad spots. The hot opener was a very strong six-man tag with Vader, Owen Hart & Davey Boy Smith facing off with Yokozuna, Ahmed Johnson, and Jake Roberts. It was fast-paced and helped build the Vader contingent as a dominant heel faction. Next up was the bizarre Backlot Brawl between Goldust and Roddy Piper - a very violent, stiff fight shot in the parking lot. This portion of the "match" taken by itself was pretty solid and accomplished what it needed to. Unfortunately it led to a lame recurring O.J. Simpson joke throughout the show and ended with Piper stripping Goldust down to his lingerie in the ring. STONE COLD! STONE COLD! ST-- Oh wait, that wasn't a thing yet? In the third slot was the debut of a young lion named Stone Cold Steve Austin, who had a decent midcard bout with Savio Vega. Nothing mindblowing, but not a bad 'Mania debut for the future Hall of Famer. The fourth match was the only real throwaway of the night, as rising star Hunter Hearst Helmsley was killed dead by the returning Ultimate Warrior (who would be gone from the company again four months later and did basically nothing to increase ratings). A pointless 90-second squash on the biggest PPV of the year. In the semi-main slot was a much-anticipated slugfest between Diesel and the Undertaker. The match moved slowly but was ultimately a very hard-hitting, well-worked big-man match, and the first good match in Taker's long WrestleMania Streak. Taker survived two jackknife powerbombs before hitting the Tombstone for the win. 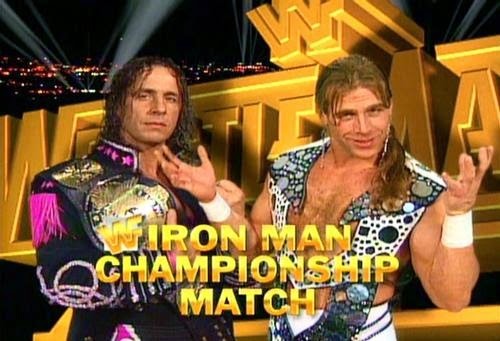 The centerpiece of 'Mania 12 was a true mat wrestling showcase between the two biggest stars (and coincidentally best workers) of the era, Bret Hart and Shawn Michaels, who squared off in the first televised WWF Iron Man match. For a full 60 minutes these two put on a wrestling extravaganza that displayed every facet of their respective games. And like an evenly-contested hockey playoff game, the final score was 0-0 when time expired. Gorilla Monsoon then announced a sudden death overtime, in which Michaels finally captured the WWF Title after two minutes. The Iron Man match was definitely not for everyone, but few WrestleMania main events have felt quite so epic. "Yo Shawn. You best be gettin' your hand out my face." I'm told that's how Bret talks in real life. WrestleMania 12 made the absolute most of the WWF's relatively small and largely unproven roster and put the focus on the in-ring product, and the result was a very strong, memorable show that paved the way for the Attitude era. What I'd Change: I'd add one fall apiece to the Iron Man match to break it up a bit, as there are times where the match does drag. I'd also have made the Goldust-Piper match end in the backlot and skip the epilogue. Finally I'd've given Hunter some actual offense so as to not allow the Warrior to completely bury him. Most Disappointing Match: Warrior vs. Helmsley - not that I was expecting much from it, but it certainly could've been made into a real match. Most Pleasant Surprise: That no celebrity guest stars appeared on this show.